A full line of machines and parts are offered through our authorized dealer network in North, Central and South America. U.S. BUILT MOROOKA MST2200VD IS NORTH AMERICA’S MOST POPULAR RUBBER TRACK CARRIER! The U.S. built Morooka MST2200VD is our most popular model in the North American market primarily because the platform is so versatile. Whether used as a dumper or carrier, it easily handles a maximum payload and has demonstrated its versatility on pipelines, construction sites and a host of other applications. The MST2200VD features a heated and air conditioned ROPS-certified cabin, backup camera, video information display, remote mirror and easy-to-use joystick control. Length 6,147mm / 20' 2"
Width 2,769 mm / 9' 1"
Height 3,175 mm / 10' 5"
Min. Ground Clearance 380 mm / 15"
Gauge 81 mm / 6' 9"
Track Width 750 mm / 30"
Length of Dump Bed 3,607 mm / 11' 10"
Machine Weight 14,464 kg / 31,820 lbs. Fuel Cap. (gal.) 216 liters / 57 gal. Maximum Load 11,000 kg / 24,255 lbs. Height of Bed at Full Dump 5,436 mm / 17' 10"
Min. 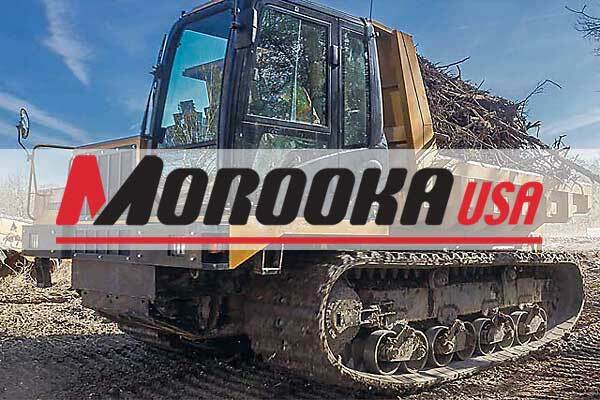 Ground Clearance 1' 7"
Morooka USA is the exclusive distributor of Morooka Rubber Track Carriers. We sell from Alaska to South America. Contact us for a salesperson near you. Your Authorized Morooka Distributor: USA, Canada, Mexico, Central & South America.